From humble beginnings—singing in the choir stalls at Church of the Redeemer in downtown Toronto—to street corners and backroom dives, the Redeemers revive the joy of doo wop close harmony singing. From the golden days of bluesy pre-rock’n’roll R & B to present day pop and top 40, this close harmony vocal group celebrates the sounds pioneered by classic groups like the Orioles, the Drifters, and the Flamingos, honed by The Beatles and Stevie Wonder, and re-imagined by more contemporary acts like the Backstreet Boys, Gnarls Barkley and Pharrell. See a sample of what they cover here. The Redeemers boast glowing reviews for performing at weddings, engagements, house parties, corporate functions, 50th anniversaries – you name it! They can perform a cappella, or with a full band, for your intimate gathering so you can hit the dance floor and shake a tail feather. 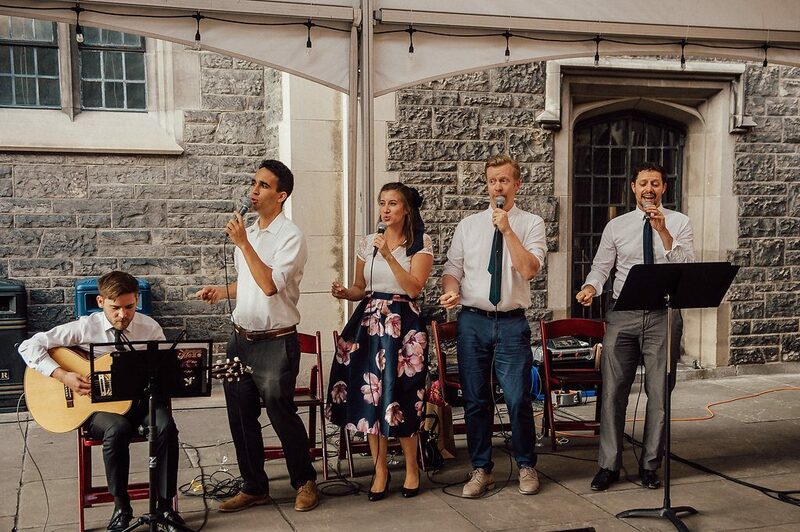 With over 500+ performances under their belt, this versatile group can perform as a five piece, quartet, trio, duo, or soloists depending on what your event demands. Are you a solo act that needs backing vocals? Do you have an unusual or obscure piece that needs to be arranged or harmonized? Look no further. The Redeemers have sung backup for grooms and bridesmaids, from classic jams to the never before heard medleys, for professional singers and aspirational (if unpolished) dreamers. Satisfied clients include the Gladstone Hotel, Bloor West Street Fest, The Vanity, Hart House, Timothy Eaton Memorial Church, and dozens of happy brides and grooms! Need someone to vouch for us? Just ask!